What Type of Caulking Do You Use Around the Tub and Toilet Adjoining a New Vinyl Floor? What Should Be Used to Fill the Gap Between the Tiles & the Shower Base? What Could Cause Caulking to Bubble Up and Come off in a Bathtub? 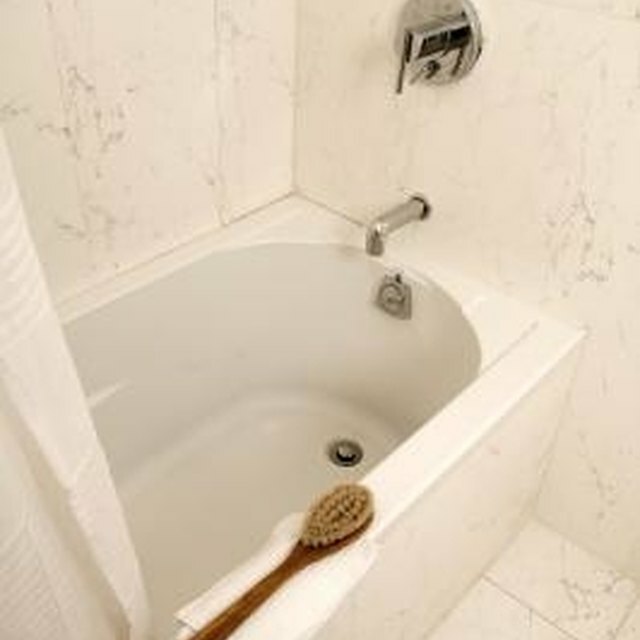 Caulking around a bathtub is necessary to prevent water from leaking behind the bathtub. When water gets behind the surface, mold can grow and damage can occur to the tiles or other surrounding surface. Caulk may begin to bubble and/or come off over time. Find out why this happens and how to correct the problem. Bubbled and peeling caulk needs to be removed and replaced. Not all types of caulk are created equally. Inexpensive caulk tends to come off quicker than a high-quality type. Additionally, what the caulk is made up of can affect how well it stays in place. In areas like the bathroom, where the humidity is high, silicone-based caulk is better than latex-based caulk. If you have latex caulk around the tub, it might bubble or come off quicker because it is water soluble. Silicone, on the other hand, is not. If moisture gets behind the caulk, the moisture can ruin the caulk quickly. Water can get in the caulk if there’s even the tiniest hole or imperfection in the caulk job. This is especially true when water-soluble caulk is used. Further, caulk will dissolve over time just from everyday use of the bathtub. So if the caulking has been exposed to water for several years, it might start to peel off. Applying caulk around the tub improperly can lead to premature peeling and bubbling. The area must be completely dry before applying the caulk. Any moisture on the surface whatsoever can interfere with the adhesion of the caulk. All of the old caulk must be removed before applying new caulk. Small remnants of old caulk can also lead to the new caulk coming off quicker. If the surface wasn’t properly cleaned prior to applying the caulk, it may peel or bubble. Additionally, any traces of dirt, mildew, soap scum or other grime can prevent the caulk from bonding. If the caulk is peeling or bubbling, it must be removed so the tub can be recaulked. Apply a caulk remover to the caulk to soften it. Follow the manufacturer’s instructions for applying the remover. Make a slice through the entire bead of caulk using a sharp utility knife. Rip off the loosened caulk with a pair of needle-nose pliers. Scrape off any remaining caulk by using the hook on a five-in-one tool. Scrub the area with a nonabrasive scouring pad and mineral spirits to remove any remaining traces of caulk. Wipe with a damp rag to remove the residue. Clean the entire area well with an ammonia-free tub cleaner to remove any soap scum. Follow up by scrubbing with a solution of 1/3 cup of chlorine bleach and 1 gallon of water to remove any mold and mildew. Make sure the area is completely dry before applying fresh caulk. Lay two parallel strips of painter’s tape around the top and bottom of the joint you’ll be caulking. Space the pieces of tape approximately 3/8 inch apart, which will keep the bead of caulk straight. Hold the nozzle of the caulk gun at a 45-degree angle at the joint, and then apply a bead of caulk straight down the center between the two pieces of tape. Keep the gun moving steadily across the joint until the entire seam is filled. Moisten a lint-free cloth with water, and pull the rag along the newly laid caulk in a continuous movement to even out the caulk. Smooth out any rigid spots with the rag. Don’t use the tub or shower for at least 24 hours after caulking. ProHandyman: Why Does My Shower Caulking Keep Peeling Up? What Type of Caulk Should I Use for the Kitchen Sink?